Professor Abdulmotaleb El Saddik, Editor-in-Chief of the International Journal of Advanced Media and Communication, has been named a 2010 Distinguished Scientist by the Association for Computing Machinery (ACM), the first ever in the School of Information Technology and Engineering and in the Faculty of Engineering at the University of Ottawa. Professor El Saddik's current research, which provides an excellent bridge between computer science and engineering, is in the area of ambient intelligence and multimedia communications. In particular, he focuses on the analysis, design and development of haptics audio visual algorithms and of collaborative protocols and applications. He is also a Fellow of IEEE, FEIC and FCAE. The Distinguished Scientist grade recognizes ACM members who have at least 15 years of professional experience and five years of continuous professional membership, and whose accomplishments in and impact on the computing field have been significant. Dr. Eckhard Lichtenthaler, from the Group for Technology and Innovation Management in the Center for Enterprise Science at the Swiss Federal Institute of Technology Zurich (ETHZ), has been promoted to the position of Editor-in-Chief of the International Journal of Technology Intelligence and Planning, following distinguished service as one of its Associate Editors. We congratulate Dr. Lichtenthaler and look forward to the journal's continued success. Professor Peter Xu is relinquishing his position as Editor of the International Journal of Intelligent Systems Technologies and Applications but will retain an interest as an Editorial Board member. We thank Peter for his invaluable service to the journal. His position as Editor will be taken by Professor Olaf Diegel, Director of the Creative Industries Research Institute and Associate Dean, Strategic Development in the Faculty of Design and Creative Technologies at Auckland University of Technology. We wish Olaf well in his new role and look forward to the continued successful development of the journal, now publishing its 10th volume. Professor Angappa Gunasekaran, Director of the Business Innovation Research Center at the University of Massachusetts - Dartmouth and Editor-in-Chief of the International Journal of Business Information Systems, has announced an increase in the frequency of issues for this journal. From January 2012, (volume 8 onwards) it will publish 12 issues per year. Following the resignation of the previous editor, Professor Nanua Singh, due to work and other commitments, we are please to announce that Professor Byung Rae Cho from Clemson University's Department of Industrial Engineering has agreed to take over the International Journal of Six Sigma and Competitive Advantage for the next couple of years, to ensure its continued successful development. A permanent editor will be appointed in due course. The Marie Curie Prize, created on the initiative of the World Council of Nuclear Workers (WONUC) and of the Low Radiation International Network (LOWRAD) is intended as a reward for scientific research and work whose goal is the improvement of scientific knowledge concerning the effects of low and very low doses of ionising radiation on human beings and biotopes. The 2010 recipient is Ludwig Feinendegen. The Atoms for Peace Committee Prize is awarded to whoever has done most for the achievement of a sustainable peace to ensure the protection of environment, the improvement of social welfare and the establishment of worldwide wealth. In its application of these criteria, the World Council of Nuclear Workers (WONUC) and the International Institute for Sustainable Peace have concentrated on the struggle to ensure a world wide sustainable peace. This year’s recipient is Maria Romana De Gasperi. Professor Kuan-Ching Li, Chair of the Department of Computer Science and Information Engineering at Providence University in Taiwan has agreed to continue the development of the International Journal of Computational Science and Engineering. The journal is currently in its 5th volume and Professor Li looks forward to "ensuring a bright future for IJCSE". On November 15, 2010, the University of Bergamo, Italy, will be inaugurating a new research center, the Center for Young and Family Enterprise (CYFEat) an event to present the Center to the local community of entrepreneurs. The mission of CYFE is to foster excellent scientific research activities on family and young enterprise applicable to international business and communities across cultures. The Center is currently working on several international projects in different research mainstreams, ranging from family business to young and social entrepreneurship. A distinguishing feature of CYFE is its interdisciplinary approach adopted to investigate entrepreneurial phenomena. More. Two more journals have announced an increase in issues for 2011. They are the International Journal of Biomedical Engineering Technology, whose frequency is increased from 8 to 12 issues per year, and the International Journal of Networking and Virtual Organisations whose issues expand from 6 to 8 issue per year. Professor Zbigniew W. Ras, Professor of Computer Science in the College of Computing and Informatics at the University of North Carolina - Charlotte in the States and Dr. Marenglen Biba, Head of the Computer Science Department at the University of New York, Tirana in Albania, have agreed to jointly edit the International Journal of Social Network Mining through its development stages and into publication. Dr. Biba will then take over full editorship, although Professor Ras' extensive experience and expertise will still be available to the journal. Professor Jun Ni, from the University of Iowa Hospital & Clinics (UIHC) Department of Radiology in the Caver College of Medicine, has taken over what was the International Journal of Computational Medical Engineering, has renamed it International Journal of Computational Medicine and Healthcare and will start its development shortly. Professor Robert De Souza, Executive Director of The Logistics Institute - Asia Pacific and Adjunct Professor at the Georgia Institute of Technology Supply Chain and Logistics Institute has stepped down from the joint editorship of the International Journal of Agile Systems and Management. He has been replaced by Professor John Mo who is currently Discipline Head, Manufacturing and Materials Engineering, in the School of Aerospace, Mechanical and Manufacturing Engineering at the RMIT University in Australia. Professor Mo has been an active researcher in manufacturing systems, enterprise modelling and industrial automation for over 30 years in universities and CSIRO. Prof. Angappa Gunasekaran, Director of the Business Innovation Research Center (BIRC) at the University of Massachusetts – Dartmouth, has announced that from its fourth volume in 2011, the International Journal of Procurement Management will increase its issues to six per annum from four at present. Dr. Yan Luo, Humboldt Fellow at the Technology University of Darmstadt in Germany, has announced that the International Journal of Computer Aided Engineering and Technology will expand to six issues per year from its second volume in 2011 onwards. This reflects the substantial interest already shown in this new title. A strong team has been formed to develop the International Journal of Vehicle Performance, one of the final links on our substantial Automotive Collection The Executive Editor is Professor Subhash Rakheja, Concordia Vehicular Ergodynamics Research Chair at the Concordia University CONCAVE Research Centre in Montreal, Canada. He is joined by 3 Associate Editors: Dr. Xiaobo Yang from the Oshkosh Corporation in the USA, Professor Nong Zhang, Professor of Mechanical Engineering at the University of Technology, Sydney in Australia and Dr. Xiong Zhang from General Dynamics Land Systems - Canada. Their experience and expertise will be invaluable to the journal's development. Because of increased professional activities, Professor Shervin Shirmohammadi, the Editor-in-Chief of the International Journal of Advanced Media and Communication has stepped down in favour of Professor Abdulmotaleb El Saddik, University Research Chair in Ambient Interactive Media and Communications, and Director of the Multimedia Communications Research Laboratory in the University of Ottawa School of Information Technology and Engineering. Professor El Saddik praised his predecessor's "outstanding leadership during his tenure." The International Journal of Cognitive Performance Support will be published in 2011. The Editor, Dr. Ken Revett, is calling for papers for its first issue. For full details, please see the inaugural issue call for papers. Dr. Rongbo Zhu, from the South-Central University for Nationalities College of Computer Science in Wuhan, China, is to develop the International Journal of Satellite Communications Policy and Management, while Dr. Maode Ma of the Nanyang Technological University School of Electrical and Electronic Engineering in Singapore has taken over the International Journal of Electronic Transport. Dr. Ma has published around 60 academic papers in the areas of his current research interests which are wireless networks, optical networks, grid computing, etc. He currently serves as an associate editor for IEEE Communications Letters and an editor for IEEE Communications Surveys & Tutorials. Dr. Farhad Memarzadeh, Director of the Division of Technical Resources (DTR) at the National Institutes of Health (NIH) in Bethesda, MD has taken over as Editor-in-Chief of the World Review of Science, Technology and Sustainable Development. 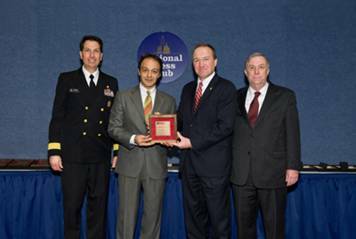 Dr. Memarzadeh was awarded 2009 Top 10 Federal Engineer of the Year by the National Society of Professional Engineers (NSPE) (www.nspe.org). Several commendations from the United States Senate for outstanding research on energy and environmental measures. The National Society of Professional Engineers is the national society of licensed professional engineers from all disciplines that promotes the ethical and competent practice of engineering, advocates licensure, and enhances the image and well-being of its members. The National Society of Professional Engineers' Federal Engineer of the Year Award (FEYA) program, now in its 30th year, is the only national award specifically recognizing and highlighting outstanding engineers employed by the Federal government. Hailing from all federal agencies, departments, and military branches, the nominated engineers are evaluated based on factors such as engineering achievements, education, professional and technical activities, awards and honours, and civic and humanitarian activities. World Review of Science, Technology and Sustainable Development will increase its issues this year (2010) from four to six. Professor Dana works in the Department of Management section of the College of Business and Economics at the University of Canterbury, New Zealand. His fields of research include aboriginal business, animal husbandry, food and fibre, government policy, indigenous entrepreneurship, international business and viticulture. Specifically, his interests include cross-cultural studies and subsistence micro-enterprise among Inuit, Sami and Canadian First Nations, with a focus on animal husbandry. Thanks to a US$100,000 grant from Royal Dutch Shell, he is also doing a great deal of work with the oil and gas industry in the Arctic and in the Russian sub-Artic. Future research will involve the internationalisation of NZ SMEs. Professor Saundra Glover, Associate Dean for health disparities and social justice in the Arnold School of Public Health, University of South Carolina, has undertaken to develop the International Journal of Food Safety, Nutrition and Public Health. Professor Glover is faculty recipient of the 2010 Martin Luther King Day Social Justice Award. Professor Glover, who has been on the Arnold School faculty for 19 years, was lauded for her "consistent commitment to educational outreach and research aimed at eliminating disparities." She also is director of the Institute for Partnerships to Eliminate Health Disparities (IPEHD) and associate director of the S.C. Rural Health Research Center. Center of Excellence in Cancer and HIV Research, a $7.5 million, 5-year partnership between the University of South Carolina and Claflin University to eliminate health disparities in HIV/AIDS and cancer in the Palmetto State. Ft. Jackson Identifying Health Barriers Project, a $1.1 million contract with the Department of Defense to examine attrition rates in military recruits. Project MATCH (Mobilizing Against Threats of Community Health), a program comprising the Arnold School, the American Public Health Association and Michigan State University, to address the convergence of animal health and public health issues. Professor Glover was jointly successful in securing approval of a $7.2 million Center of Economic Excellence in Prostate Cancer with two lead investigators from the Medical University of South Carolina and South Carolina State University. Professor Cheng was also named as one of the "most cited scientists" in "All Fields", "Computer Science", and "Engineering" over 1992-2002, 1993-2003, 1994-2004, 1995-2005, 1996-2006, 1997-2007, 1998-2008, 1999-2009, 2000-2010 (top 1% in terms of citation count) and has attained an h-index of 27 (i.e., having produced 27 publications each attracting 27 or more citations) in ISI Web of Science. The top h-index POM researcher (Professor Gilbert Laporte with an h-index of 30) is also one of the editorial members of the International Journal of Shipping and Transport Logistics. In addition, Professor Laporte is the most productive author in five leading POM journals (1959–2008). Professor Cheng is also on the Editorial Boards of the International Journal of Advanced Operations Management, International Journal of Business Performance and Supply Chain Modelling, International Journal of Electronic Transport, International Journal of Information and Operations Management Education and International Journal of Mathematics in Operational Research, while Professor Laporte also serves on the European Journal of Industrial Engineering and International Journal of Advanced Operations Management Boards. Dr. Ambjörn Naeve, Head of the Knowledge Management Research Group at the Royal Institute of Technology in Sweden and Editor-in-Chief of the International Journal of Technology Enhanced Learning, has announced that the title will move from four to six issues from its third volume in 2011. The publication of the first issue of the International Journal of Aerodynamics brings to 300 the number of published titles in the Inderscience portfolio. This milestone was no sooner reached than the number increased further with the arrival of the International Journal of Critical Computer-Based Systems. The inaugural issue of the International Journal of Cognitive Biometrics will focus on the deployment of biosignals, although other papers relevant to the journal coverage will also be considered. For full details, please see the inaugural issue call for papers. Prof. George Constantine Giakos, one of the International Journal of Signal and Imaging Systems Engineering Editors-in-Chief, has just been appointed as an IEEE Fellow. The citation reads: "Recognizing the achievements of its members is an important part of the mission of the IEEE. Each year, following a rigorous evaluation procedure, the IEEE Fellow Committee recommends a select group of recipients for one of the Institute's most prestigious honors, elevation to IEEE Fellow. The IEEE Board of Directors [has] elevated you to IEEE Fellow, with the following citation: "for contributions to efficient imaging devices, systems, and techniques"
The International Journal of Exergy has decided to increase the number of its issues from six to eight per annum, starting in 2011. The journal, indexed in the major services including Science Citation Index, Compendex, Metadex, Inspec, etc., continues its successful growth under its dynamic editor, Professor Ibrahim Dincer from the University of Ontario Institute of Technology. Dr Xubin Song, Principal Engineer at Eaton Corporation, has bee appointed to develop the International Journal of Powertrain, one of our unique collection of automotive journals. Dr. Song has been actively chairing SAE Powertrain, Drivetrain and Transmission Committee, and is also serving as Associate Editor for ASME Journal of Dynamic Systems, Measurement and Control. His expertise is on powertrain, vehicle control systems, hybrid vehicle development, for which he has more than 10 years working experience at Visteon and Eaton.